All of our Harrogate Advertiser Excellence in Business winners celebrate with their awards. Over 360 business people from across the district packed into the Pavilions of Harrogate Thursday night for what many later said was the best-ever Harrogate Advertiser Excellence in Business Awards ceremony. The black-tie event was the culmination of a months-long awards process which had been launched back in December, and the long wait had stretched some entrants’ nerves almost to breaking point. The Harrogate Advertiser Excellence in Business awards ready to be handed out. The tension was finally released over the course of the evening, as the winners were announced one by one by veteran BBC Look North broadcaster Harry Gration MBE, who kept the pace brisk and the tone lively. Among the big winners on the night were The Harrogate Bus Company who secured the Best Large Business Award and the Harrogate International Festivals who took home the Tourism Award. Individual honours went to Sharon Canavar, Chief Executive at Harrogate International Festivals who picked up the coveted Business Personality of the Year award and Lesley Wild, group chair of Bettys & Taylors who was honoured with the Lifetime Achievement Award. 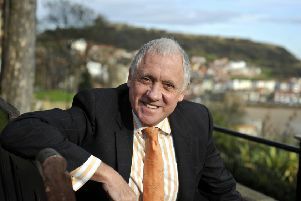 Other VIPs included Harrogate and Knaresborough MP Andrew Jones and the Lord-Lieutenant of North Yorkshire, Johanna Ropner, whom Gration jokingly referred to as his boss, since he had earlier been announced as one of the county’s new Deputy Lieutenants. BBC presenter Harry Gration MBE kept the guests entertained throughout the evening. Full coverage of the event, including photos, will be included in a special 16-page supplement in the next edition of the Harrogate Advertiser on Thursday April 11. Full coverage of the event, including photos, will be included in a special 16-page supplement in the next edition of the Harrogate Advertiser on Thursday April 11..